No, it’s not the centuries-old architecture, the majestic countryside, the fabulous art, the sonorous Italian language or the easy access to copious amounts of exceedingly good gelato. Believe me, after a while you get used to living the good life in Italy and start accepting as normal the fact that the building in front of you was designed by the most influential architect in the Western World or that any small cafe serves proper thick hot chocolate which would be a rare delicacy anywhere else in the world. Yes, I have been spoiled! I admit it myself. At the same time there are some things which will never cease to amaze me. They are tiny in the big picture of what Italy really is in terms of art, traditions, culture and amazing food, yet, they have the uncanny ability to always surprise me, make me laugh or even squirm with fright or embarassment. Sometimes, they even give me a moment of utter ‘Only in Italy!’ disbelief. So, today I want to tell you about them. Now, coffee is loved all over the world. Honestly, it is one of the most successful products ever and has managed to become an indispensable part of our everyday life. Yet, for all the chain coffee shops out there serving fancy coffee-based drinks flavoured with syrups, diluted with pints of milk and spiced with what-not (pumpkin chai latte, anyone?) Italy is still unsurpassed in its approach to and preparation of a good honest cup of coffee as it should be. 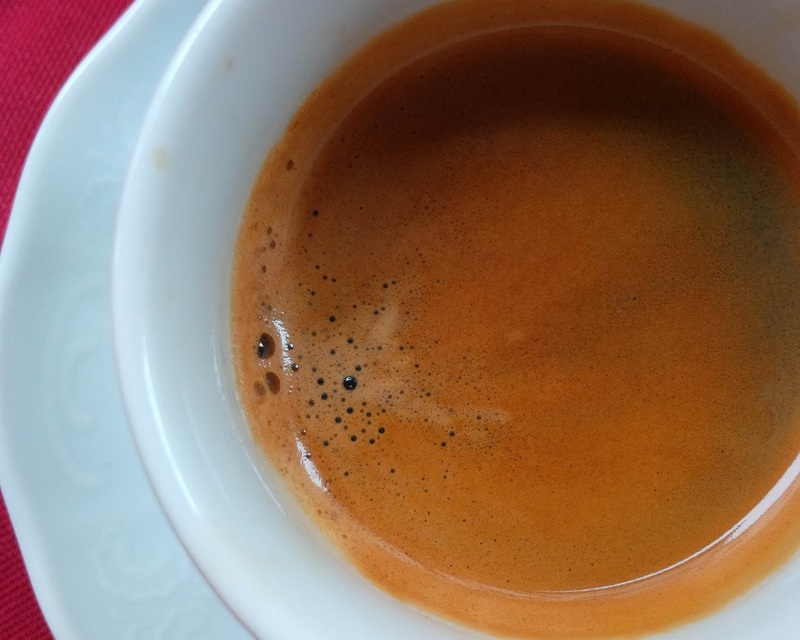 A cup of Italian espresso, for example, is strong, aromatic and it gives you a real kick and zest for life. Yes, even the decaffeinated version, which, in my experience, is more powerful than any double espresso that I have had outside of Italy. Coffee in Italy, customarily, is never ordered to go. I am yet to see people on their morning commute clutching large paper cups desperately suckling from them. 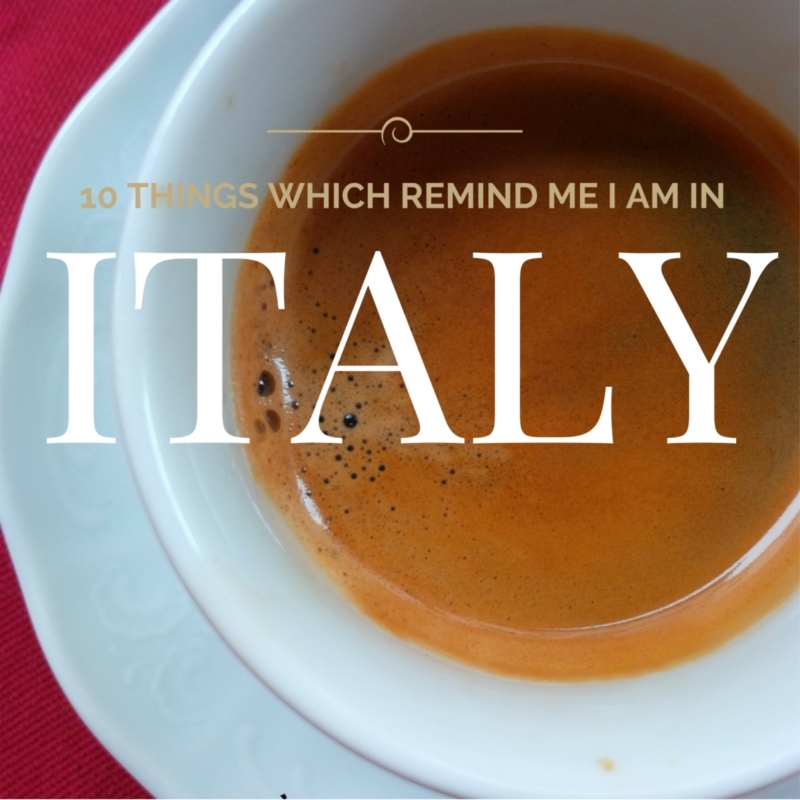 Instead, the locals walk into one of the many bars dotted around towns and cities in Italy, order a quick espresso at the counter and with an abrupt movement of their wrist lift the small espresso cup to their lips, drink it all in two-three sips and off they go. Cups in which coffee is served are also much smaller than the ones used in England, for example. A cappuccino cup in Italy seems to contain about one quarter to one third of the quantity of liquid filling a cappuccino mug in a London chain coffee shop. Coffee is also widely used to flavour Italian desserts – from tiramisu to cremino – and you can easily find coffee-flavoured yogurt in any supermarket here. Another interesting thing is that coffee machines, which one can see in offices, hospitals, airports and even teachers’ rooms in schools, have a mind-boggling array of options. I was so amazed by the huge coffee machine at Marco Polo Airport in Venice, serving over 20 types of coffee, that I tried to snap a quick picture of it. As I stood in front of it, getting my camera ready, a lady carabiniera simply bypassed me and positioned herself in front of the machine. Would I want to stand between an Italian policewoman and her regular dose of caffeine?! I quickly retreated without taking a photo. I have to say this is one of my most favourite things here in Vicenza. At regular intervals throughout the day you can hear the bells of the local churches ringing. It is not some sort of a ‘boom-boom-boom’ racket though. It is a proper tune, a little melody – which seems to be different for each church – which the set of large and small bells in the tall bell-tower standing by every church in town harmoniously performs. I wish I knew what each session of bell ringing meant. Is it an invitation to attend mass, is it marking the start/middle/end of day or is it a sign for a celebratory event. May be I should find the courage to ask in my broken Italian the Franciscan monk whom I sometimes see in front of a local church. With his jovial face and booming voice he chats to the people coming in and out of the church. Once, as I was passing by, he boomed at me: ‘Ma, dove sei?! Il Polo Norte?’ (Where are you from?! The North Pole?). The reason for his witty remark being that I was wearing a jumper when everybody else around was tightly wrapped in thick coats and scarves. In my defense, I have to say, it was 13 degrees Celsius that day, so it wasn’t actually that cold. Excuse my perhaps rather strange fascination with it, but, yes, it fascinates me that you can see monks and nuns going on about their daily business on the streets of Italian cities and towns. Considering my non-religious upbringing in a country in which religion was forcefully if not abolished, at least made to feel un-desired and not needed from 1944 to 1989, I find it mesmerising that people have the liberty and the calling, if they so wish, to renounce the joys and vices of this world and dedicate themselves to higher causes. I often see nuns walking down the street in Vicenza, dressed in their habits. They always seem to have these very gentle, kind faces and they never miss to smile at a passing by child, sometimes even stopping, asking for the child’s name, how old he is and then patting him lightly on the head. I remember being in the local supermarket about a year ago, soon after our arrival to Vicenza, when a monk walked in in his brown habit and with a shopping basket in hand. It felt so surreal. The only monks I had ever seen in Bulgaria were usually very old men who lived a very solitary life behind the walls of the country’s monasteries. And here there was a monk who was part of real life, religion had not been amputated off society like it had happened back home for political reasons in the 1940’s. I also felt like a total ignoramus, as I wasn’t sure what you were supposed to do when a monk or a nun passed you by. In the end, I copied what the Italian shoppers around me did and said ‘Buongiorno!‘ to the monk when he passed by me. He politely replied and went on his way. Yep, people being super polite and acknowledging each other felt so new to me in my first months in Italy. It still hasn’t worn off. I don’t know if it is something typical just in the smaller cities and towns or an accepted practice all over Italy. What I know is that when they enter their GP’s or dentist’s waiting room, for example, people greet the other patients already waiting there. On their way out, a polite ‘Have a good day!’ is addressed to everybody present, too. People also greet the sales assistants when they walk into shops. Then they may indulge in a little chat, too. I quite like it and try to do it, although, sometimes, I find it hard to break a habit built over 14 years in the UK, where personal space is valued above it all and people avoid direct eye contact, especially in confined spaces, like when they are on the tube. For all their politeness face to face, the Italians seem to become completely different people once in the driving seat. They are only too happy to overtake you, cut in front of you and, even, surprise you coming up at you in an otherwise one-way street. Crossing a street is also a different ballgame. Whereas in the UK zebras are clearly marked with flashing lights, there are no such extras here, plus drivers may not stop even though you may already be half way across the road. They simply keep driving, perhaps hoping that you will know better and not walk too fast so as to reach their portion of the road just when they are there. A few days ago, my husband came across a survey ranking countries based on their driving abilities. According to it, the Italians drivers were the eighth best in the world. Not sure how this result came to be. We constantly see cars with bumps and scrapes, missing front lights and the like. Indicators, even on roundabouts, are not often used and we have seen toddlers being driven around without being strapped in safety car seats. In a nutshell, driving in Italy is not for the faint of heart. Being Bulgarian, I have seen my fair share of bad driving, as my compatriots can be a bit aggressive on the road. My English husband, accustomed to the polite British school of driving where everyone is considerate of everyone, earnestly assured me this summer (after driving on Bulgarian roads) that Italy is still more challenging for him.